PTC Windchill 10.2 M010 introduces a new type of option choice rule called a conditional rule. Option choice rules ensure that the user has selected valid choices when configuring a product structure with the Option filter. PTC Windchill 10.2 M010 introduces a new type of option choice rule called a conditional rule. Conditional rules use “if” and “then” statements. These statements specify when certain option choices should be included, enabled, or disabled based on the choices that the user specifies in the Option filter. Conditional rules are available with a license for the Platform Structures module, which is an add-on module to PTC Windchill PDMLink. Conditional rules enable you to better control the desired behavior during the choice selection process in the Option filter. Conditional rules allow users to specify the logic for choice selection. Conditional rules consist of "if” and “then” statements. The “if” statement describes the selections that trigger a certain action. The “if” statement contains one or more boolean expressions combined by an “or”. The “then” statement describes the action that should be applied to the set of choices when the “if” expression is evaluated to "true." The New Conditional Rule window is used to enter the “if” and “then” statements. 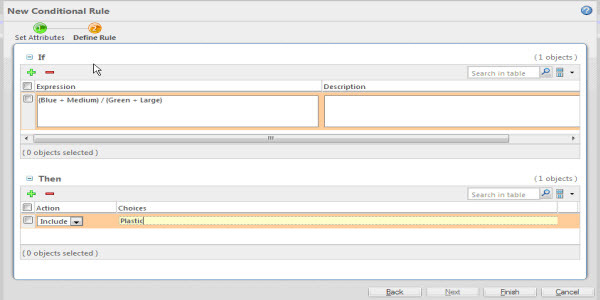 The rules are evaluated as the user specifies the choices in the Option filter tab of the Edit Filter user interface. Conditional rules are created using the New Conditional Rule window.